One of my favorite homemade Christmas gifts to receive from neighbors are sugar and cinnamon roasted almonds. If you are up for making them, they are a great party treat or neighbor gift. If you are looking for something a little more savory, these sweet and spicy pecans mix sugar with chili powder and cajun seasoning to give them a little kick. You can get this killer pecan recipe over at Purple Chocolat Home. I found a similar recipe in a fundraiser cookbook I bought. Was going to try them this year. I love spiced pecans, and the packaging is cute. 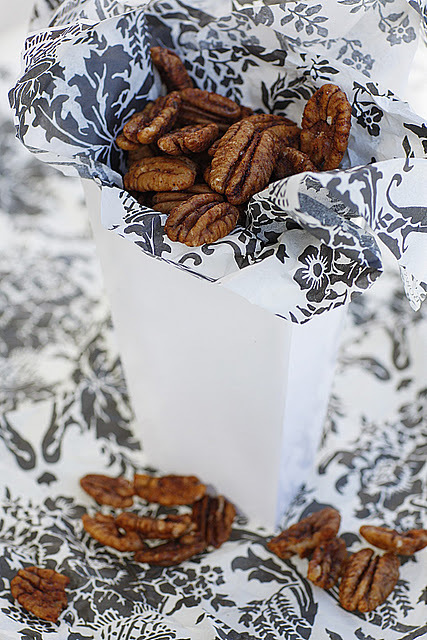 Oh, thank you so much for featuring my pecans! We have a tough time keeping them around. They are just gorgeous on your blog! Isn't that funny that they would look different to me like that. Thanks again for the shout out.